November 15 is a sad day in the life of an Eastern Sierra trout angler. It is the last day of the general fishing season. Fortunately, there are a handful of special regulated waters that offer winter fishing opportunities in the off season. They’re the West and East Walker River, Hot Creek and the upper and lower Owens River. This will satisfy the needs of anglers until the season reopens on the last Saturday in April. In big snow years access to the special regulated waters is very limited. The lower Owens River is accessible all winter making it the primary water to fish. The best winter fishing opportunities on the Owens River are from the penstock above Pleasant Valley Reservoir to Warm Springs Road bridge. The river below Pleasant Valley Reservoir is split into two sections by regulations. From Pleasant Valley Dam to Five Bridges Road, the river is managed as a wild trout stream with three sections of regulations (check with California Department of Fish & Wildlife for the rules in each section). From Five Bridges south, the river is stocked by CA Fish & Wildlife along with supplemental stockings from the Bishop Chamber of Commerce. Fly fishers take advantage of low winter flows, blue wing olive (BWO) mayfly hatches and mild winter weather on the wild trout section of the lower Owens River. Fly fishers use BWO imitations to fool wild brown trout from 5 to 15 inches. On a day with a good hatch it’s easy to land 20 to 30 trout in a couple of hours. Beware of congestion from three-day holiday weekends and fly fishing club outings. Mid-week anglers will find more serenity when plying the waters of the wild trout section. As the days begin to get longer in January, and are just starting to warm up, the fish and insects become active offering great fishing opportunities. This will continue through May until the weather heats up for another summer. The farther south on the Owens River you get from Pleasant Valley Reservoir the wild trout population wans and the trout population is augmented with stockings of rainbow trout. These trout will readily take lures, flies and bait. Access to the river is inhibited by dense stands of riparian vegetation – mostly willows. Anglers who explore the river will find holes and runs to ply with their favorite offerings. 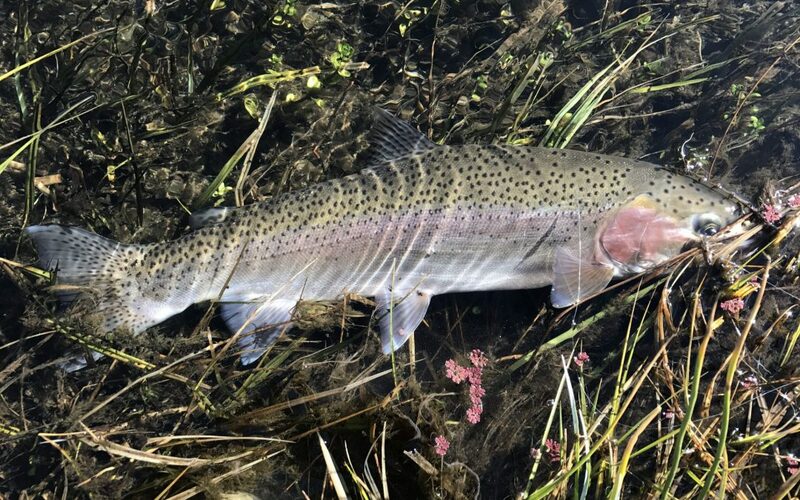 Anglers who continue to fish on the Owens River in winter time are treated to wonderful warm days with lots of trout to be caught. Winter fishing on the Owens is really good. It might be better than summer fishing.